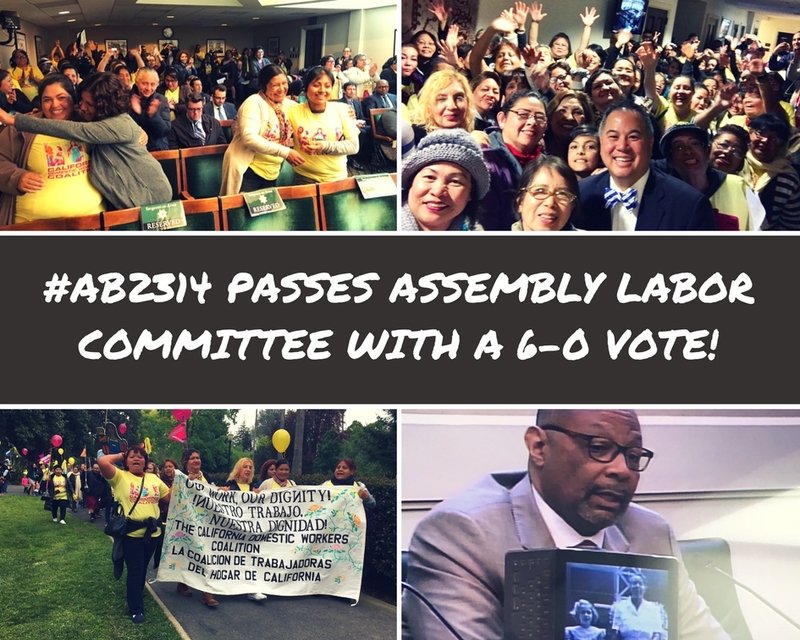 Last week, in a strong show of support and recognition for the dignity of domestic workers, the California Assembly Labor Committee passed AB2314 (Ting) the Domestic Worker Rights Implementation Act! Before heading to the committee hearing room, in true, lively, and beautiful California Domestic Workers Coalition fashion, our leaders symbolically swept the steps of the capitol, cleaning up and sweeping away the high rates of labor rights violations and exploitation that so many workers face in the domestic work industry. Check out coverage of our theatrical action here. Over 130 domestic worker leaders, employers, and supporters travelled to Sacramento to witness the vote and to bring visibility to the need for greater education and enforcement of domestic worker rights across the state. “There are thousands of women like me in California. The majority of domestic workers are immigrant women, and many do not know their rights or are afraid of asserting their rights in the face of exploitation because we are immigrants, because we are women, because we may not speak English, and because we work a job that historically has not been valued. I came here today to be active in the implementation of my rights,” said Maria Colin of ALMAS and the Graton Day Labor Center, who represented the coalition and testified in the Labor Committee that day. The Assembly Labor Committee listened intently to Maria and to Hand in Hand domestic employer leader Nikki Brown-Booker before expressing overwhelming support for AB2314. “I am here, able to cast my vote today, thanks to my grandmother who was a domestic worker,” said Assemblymember Jones-Sawyer, who was followed by more moving words of support from the Committee Chair, Assemblymember Tony Thurmond and Assemblymembers Ash Kalra and Kevin McCarty. Each Assemblymember recounted their own personal connection to domestic work in their families and communities, and each expressed their desire to play a leading role in advancing the bill alongside our Champion, Assemblymember Phil Ting. At the moment when the vote was declared, our cheers erupted from the hearing room and the overflow-areas where we watched the hearing take place. Luckily, we were able to capture some of our victorious moment in the halls of the capitol; check out the video here! Next, AB2314 heads to the California Assembly Appropriations Committee. Onwards! ¡Adelante! Abante!